Moog Animatics is pleased to announce the release of its new, Low Temperature Range (LTR) SmartMotor™ in two standard NEMA frame sizes, model SM17205M-LTR (the “LTR-17”) and model SM23165M-LTR (the “LTR-23”). Both motors have been meticulously engineered for robust and reliable operation in extremely frigid environments and at high altitudes. To achieve this, onboard internal heaters ensure that the motors can start up in temperatures below -40 degrees C. Along with this, other design changes allow these motors to withstand random vibrations up to 6 G RMS, 10-2000 Hz, and standard IP sealing protects the motors from condensation. 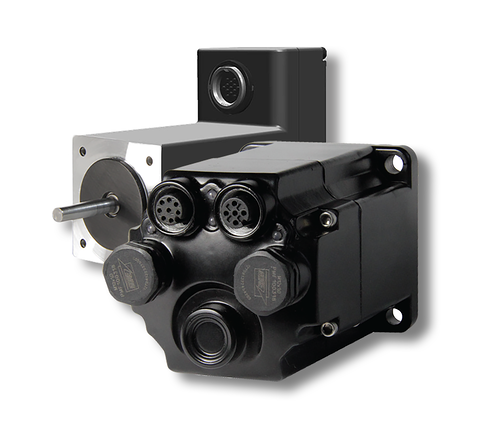 Only the Moog Animatics LTR-17 and LTR-23 motors allow you to have SmartMotor™ capability in a fully integrated, IP-sealed package specifically designed for extremely low temperature and high altitude applications. Contact Moog Animatics today for more details on how the new LTR SmartMotor™ will simplify development, reduce cost and get your low temperature and high altitude applications to market ahead of the competition. For RoHS-exempt applications only – the LTR motors contain lead-based solder on some internal components to achieve increased reliability over greater thermal ranges. IP sealed only when mounted to an equivalently sealed mating component. LTR-23 IP67 sealing available only within operating temperature—requires a flurosilicone O-ring between motor flange and IP67-rated mating component.